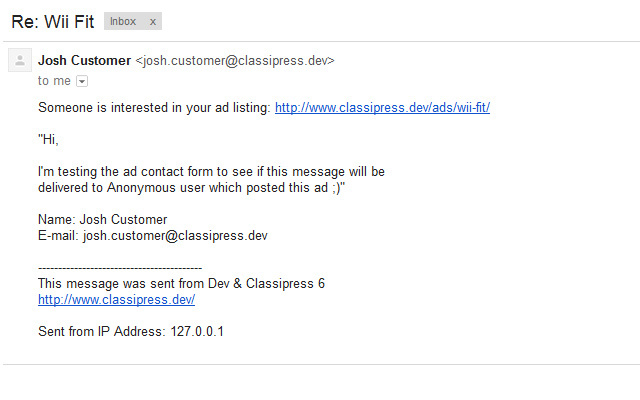 Adds anonymous ad posting functionality to your ClassiPress site. Your users will no longer need to register on your site to post an ad. Note: reCaptcha will be added to Ad submission form when it’s enabled in “ClassiPress->Settings->Security tab”. 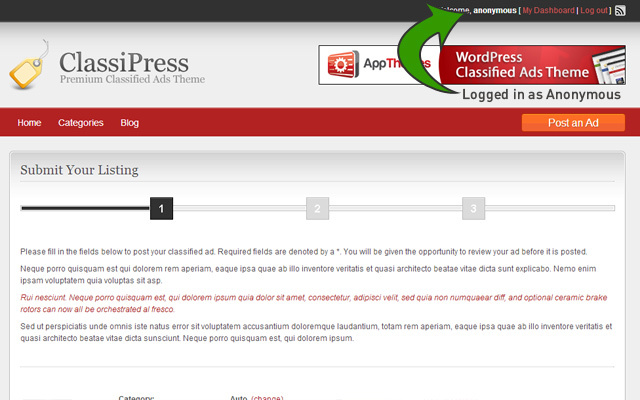 The Anonymous Posting plugin will work only with ClassiPress theme. Once activated, logout, and test anonymous ad posting functionality. please give me back my money… it doesn’t work, I can’t see it in my dashboard I have the latest version of classipress theme. @vivakodo Issue with reCaptcha has been fixed, please update plugin. 1. Let every poster have their like ‘own account’, in the current version, only one poster can post at a given time, otherwise records filled in mix. Issue has been fixed in 1.5 version. Please update plugin on your site. Problem with "Anonymous Posting for ClassiPress". Hi all, i have a problem with this plugin. 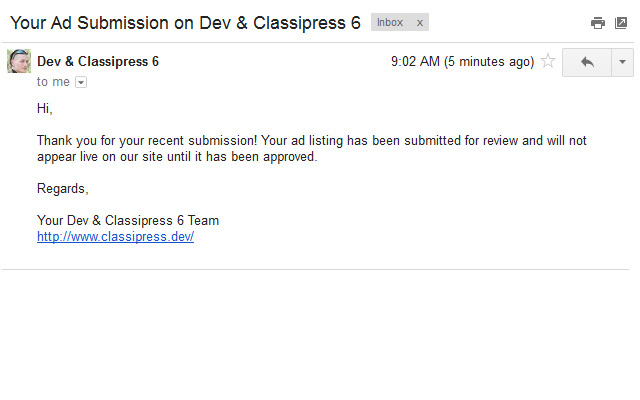 I’m using this plugin in my ClassiPress website, but it works well when only one user is posting an ad. When more than one user are posting ads in the same time, it seems that everyone is writing on the same ad. If me and other users are writing ads as anonymous user in the same time, i can see titles, description and photos that other users are writing in that moment. Photo loaded for a long time, how to fix it?! I’m using it with Jibo Child theme (ClassiPress Parent Theme). I highly recommend everyone to use it, if willing to populate records to your classifieds website. Easier for outside users also. I have use it at http://www.4jat.com – and I’m very happy with it. The user “Anonymous” can not delete their own ads after the item is sold . . .
No demo, that’s why bunch of screenshots is above. Your plugin is amazing and it works fine on my Classipress multisite apart from two minor issues that I need your help please. Thank you for your recent submission! Your ad listing has been submitted for review and will not appear live on our site until it has been approved. The second issue is with the admin email after posting and ad, and it is only happening on subdomains. I got the admin email translated like it should be but the link to edit the ad is missing, it´s just there the link to see the ad. Anúncio aguardando aprovação no Classificados grátis. Can you please give me some help? Replied in thread on forum. What about preventing spam? A demo should be available to see how your plugin works and to take necessary measures against spam, a very serious problem. reCaptcha will be added into version 1.1, which will be available tomorrow or on monday. reCaptcha has been added, version 1.1 is already available. can you add question/answer captcha? how ad poster can manage his ads ? In current version of plugin anonymous user can’t manage his ads (edit,renew,delete) after posting, this is planned for future release. Hi, i have classipress 3.3 . so will it work with it? and if the plugin doesnt work with my site will you refund ? On ClassiPress 3.3, plugin will be missing ’emails filtering’ functionality as filters to emails in CP has been added later. Yes, you can ask AppThemes about refund. I can not replicate issue on my site, so please open thread on support forum ( http://forums.appthemes.com/anonymous-posting-classipress/ ) and include url to your site. Does this plugin work for paid ads or for free ads only? Thanks. Works with both, free & paid. ok great. So what I’m looking to do is reduce the number of steps it takes for visitors to create an ad. Bypassing the registration does help. I’m sure there is a way to capture at least the user’s email during the ad posting process? I have Advanced Custom Fields. Thanks. Yes, when anonymous user posting an ad, he need to fill additional email field, and if reCaptcha is enabled in CP, it is also displayed for him. Cool. Is there a demo site where we can see the plugin in action? Thanks. If i install this plugin, is it possible for users to still make a users account or are all the ads going to be posted anonymous? Yes, after installing this plugin users still are able to create normal accounts and use them. I installed it but it looks like users are not able to stil make their own account it just posts everything to user anonymous. How do i change that? Are you saying that visitors can’t access Login & Register pages? If a visitor comes and they post an ad it posts ad under the anonymous account and does not allow the visitor to create an account. How do I fix that? Do it in reverse way… first login, then post an ad?! Hello: We will buy this. Just 2 points. 1. Its easy translate message to customers? Are they pre made by you? 2. Any issue with other plugins like Shareaholic or ShareThis or Captcha? Hi, I have download the plugin but there is email address field in posting steps for anonymous user? Thanks for prompt respond. My question was Hi, I have download the plugin but there is NO email address field in posting steps for anonymous user? what can i do to activate this feature? Does not support this after. It is a pity 🙁 developer has disapeared. Does this plugin ‘Anonymous Posting for ClassiPress’ works fine with Jibo Child Theme (ClassiPress). I haven’t tested it with the Jibo Child Theme, but it should works just fine. I would suggest putting a checkbox under email field, so user has to click it, so he knows he is posting as an anonymous user. Is there a way to make a screen (after pressing the Post an Ad button) that asks them if they want to register or post an ad anonymously. Also, clicking the Dashboard link give you a 404 page. Any word on when you will be adding the ability for an anonymous user to manage (edit or delete) their listing? I see you mentioned adding that functionality back in April. This is standard for sites like craigslist. And it seems like a must have for anyone wanting to post an anonymous ad, or classifieds sites that don’t require users the hassle of registration and offer anonymous only ad posting. Any info is much appreciated! I’ll be working on this after ClassiPress 3.4 release. Any news when you will be adding the ability for an anonymous user to manage (edit or delete) their listing? I have Classipress 3.4 and the latest 1.4 release. 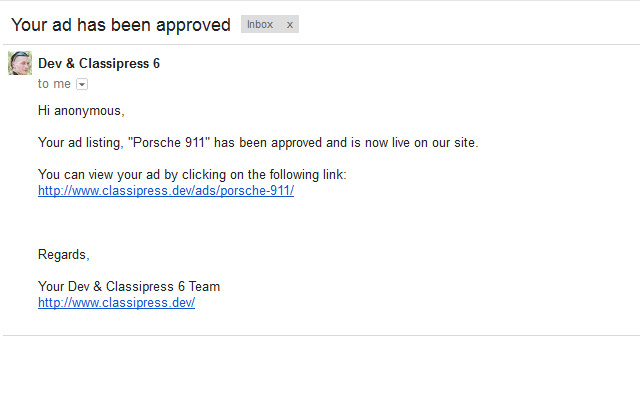 When the user get the approved ad e-mail they have the link to the ad with the auth key in the link. When the user click on the link they will get to the ad but without the auth-key in the url. I´m using permalinks, is there an issue to use permalinks with this plugin? I already have email field in my custom form . Anonymous Posting add to other email. 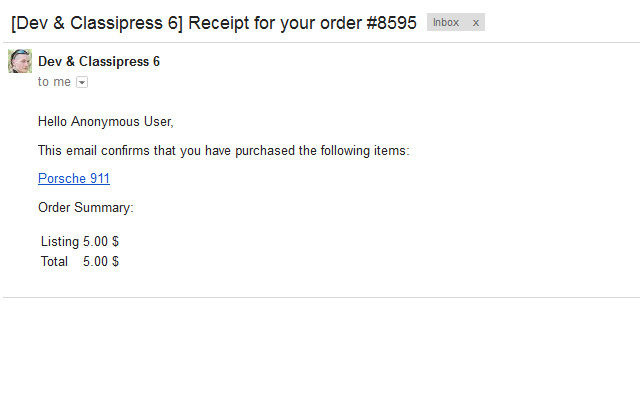 For login user I got one email. but Anonymous user I got two email . Can I get rid of email field in Anonymous please. There is an extra constant that can be set in your child theme by which you can tell plugin which field to use from you custom form instead of the default email field that adds plugin. I would like to ask you one question and so need help. When the user visit site the click on Post an Ad. Then they select category for their product, but nothing happen more. How can I solve it? I am waiting to your replying. Does this make *all* Ad Posters anonymous, or only give them the *option* to be anonymous? Sorry, one more question –Can the admin set it so that all ad posters are anonymous, rather than giving the user the option? You can disable registration on your site, so the only one option to post an ad will be as anonymous user. I’m having a problem with the Anonymous Posting plugin. After a user posts an ad, the email they receive has “Edit Ad:” but no link to the ad with the auth key. I’ll give you a rundown of my setup along with what I’ve tried as far as troubleshooting. I’m running ClassiPress v3.4 on WordPresss 4.1. I’ve disabled my child theme. Disabled all my plugins except Anonymous Posting. And I’m testing with a separate browser not logged in with a cleared cache. 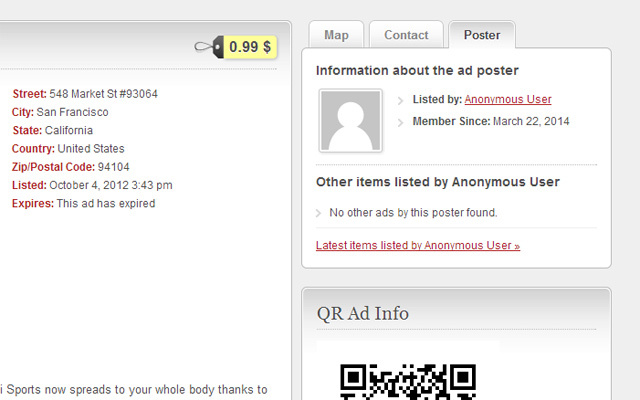 I have downloaded a fresh copy of Anonymous Posting from the AppThemes website and re-uploaded and activated it. In ClassiPress Settings > Listings, I have “Allow Ad Editing” checked and “Allow Ad Relisting” checked. 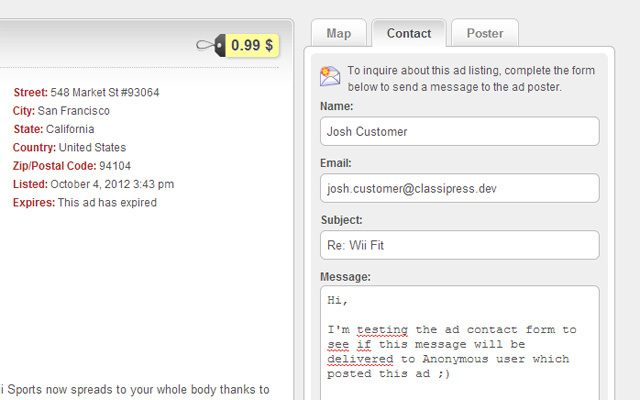 In ClassiPress Pricing > General, I have “Charge for Listing Ads” unchecked. And for Pricing Model I have “Only Charge for Featured Ads” selected. In ClassiPress System Info > Advanced, I’ve Flushed the Entire ClassiPress Cache. I should mention, there is no problem submitting ads anonymously. The user is receiving an email but the “Edit Ad” field in the email is blank. One thing that’s probably important to mention… After a user completes the ad submission process, there is the message on last page stating the ad has been posted successfully (with a link to it). But up in the toolbar at the top shows that the user is now logged in. Cicking on the dashboard link next to “Log Out” DOES IN FACT bring the user to a page where they can edit or delete the listing. I just can’t seem to get the system to email the user a proper email with an ad management link. What I could be missing here? Any insight is very much appreciated!!! I think that is a lost if “anonymous plugin” does not create an effective account. In this way we are not loosing the contact with our possible customers. Sometimes is not about the new users, is about how you can keep the old ones. How to change Anonymous User name ? How to Edit “Anonymous User Post” after Approved add ? After posting an Ad by anonymous user, to email address he provided is sent unique url by which he can manage his Ad. Accept payments in any of 27 payment methods in Polish and Zloty currency. Jumpstart your Clipper site with affiliate deals from Webgains.